When it comes to weddings, people usually decide upon either a winter wedding and Summer wedding. These are the most popular choices and depending on which one you are attending, you're more than likely going to be wearing a different outfit. Here we are going to tell you what you should be wearing to a winter wedding. Read more Men's Style Guide features and check out our Store. When it comes to your winter schedule, you will probably find that it is one of the busiest times of the year. While you'll probably be inundated with festive parties, Christmas dos, New Year's Eve events and the odd Thanksgiving meal, you'll also more than likely find that you have a wedding to attend. Now as always, what you wear to a wedding is a pretty big deal, especially in this day and age where it takes literally nothing to annoy a bride or groom and supposedly ruin their big day. This might be by way of getting too drunk or prematurely eating the cake, but that said, your outfit could also piss them off. So first things first, you need to properly nail what you're going to wear on the head and while you may be sat there thinking 'well I went t0 a wedding last summer and my outfit was great', the first rule to remember is that summer and winter wedding attire is completely different. Typically the first thing you should do is check the invitation, as chances are the people getting married have actually outlined a dress code for you and this should be your indicator of how to dress on the big day. When it comes to dressing for a winter wedding, you can always expect it to be cold, especially if you are living in the United Kingdom. Here we have just experienced one of the coldest winters on record and this kind of weather definitely determines what you will want to be wearing. Remember that weddings aren't just inside. Typically the happy couple have set time aside for pictures which more often than not are outside, and let's face it you're not going to want to be stood waiting around in a flimsy suit jacket. So what do you wear to a winter wedding? Well, below we've come up with some simple tips and advice that we hope you'll follow when deciding what on earth you're going to wear to one. As we've said, with a wedding taking place in the winter months you can expect that it is going to be bitterly cold. If you know this is going to be the case then what you want to do is invest in a three-piece suit. The reasoning behind this is obvious - the extra layers will keep you warm, whilst making you look extra smart. Adding in a waist coat will give you additional insulation, so when you're outside waiting for it to be your turn to have your picture taken, you can guarantee that you'll feeling a lot warmer than you would be if you had worn that suit you wore to that summer wedding. If you don't fancy wearing a three-piece suit, or perhaps you aren't close enough to the bride and groom to dress up this smartly, then we suggest going for a standard suit in a suitable material (we'll move onto which material shortly). What you need to remember is that, with all suits, fit is everything. When it comes to a wedding, they say that all eyes are on the bride and groom, but don't think that means you can shy away from going the extra mile. Remember that if divorce doesn't swing their way, the pictures taken on the big day are likely to be shown countless times for the foreseeable future, so you probably want to be looking your best. Go for a suit that has a natural shoulder line, sits tightly at the waist (you don't want a baggy suit on any occasion) and if you feel comfortable enough, find yourself some trousers that taper slightly. If you already have a suit that you just can't let go of and could do with a bit of modernising, then head down to a tailor to get it sharpened up. This isn't actually as expensive as you probably think and will leave you looking a lot better than if you just threw it on as it was. The same goes for if you are buying a new suit - chances are it will fit your rough measurements, but if you want it to really fit like a glove then you are going to need to go down to a tailors and have them see to it. 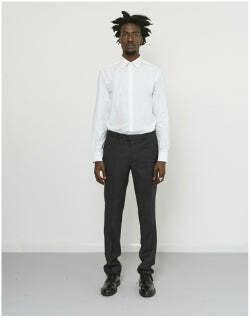 Whatever suit you choose we always suggest and encourage that a white shirt is best. Don't go for anything gimmicky and if you aren't sure, follow your gut instinct and avoid whatever you've got your hands on and stick to white. That way, you'll look put together and the only thing you need to worry about is your shoes and a tie. With this in mind, assuming that it is a suit that you are required to wear, before you start even looking for one you need to assess what material it is that you're after. For a winter wedding, as we have mentioned before and cannot stress enough, chances are there will be points when you will be feeling the brutal chill that comes with those colder months. If you think this will be the case then you're going to want to get yourself a suit that comes in a heavier material than if you were going to a summer wedding. While a linen suit may look nice and you may think 'sure that looked great on me back in June, i'll just wear that again', it's going to do you no favours when you're inevitably stood outside in the icy climate. Any wedding that takes place in the United Kingdom between the months of October and March you can guarantee will be met with arctic temperatures. This means that a linen suit is completely out of the question. Instead for a wedding in the winter, you're going to want some heavy duty materials and this is the best time to make the most of an opportunity to wear some of the best materials and fabrics out there. When it comes to selecting your suit, try to opt for one from an Italian or British brand. They really know what they're doing when it comes to suits (we have the learned experiences from the Savile Row giants over here and Italy is home to the likes of Bottega Veneta, Emporio Armani and Gucci, so they also know what they're doing). Material wise, winter boasts a great opportunity for you to wear something you probably won't find yourself wearing at any other time of the year. Think corduroy, wool and tweed for when the cooler months hit. Wool is your best bet for the icy December month and a woollen suit will keep you extra warm due to the extra punch it carries in its weave (the way its constructed). Tweed will look most suitable in the build up to December, so if you have a wedding in November (and particular if it's a country wedding) this will be perfect. As heavy as tweed is, it isn't necessarily that warm due to it construction and so it probably isn't as suitable as wool would be if you were attending a Christmas wedding. Corduroy is having a moment as of now and it is one of the top trending fabrics in menswear. This is thanks to a resurgence in the popularity of the Seventies and the fashion that came with it. Corduroy is extremely versatile and can be dressed down or up, but in this case you will want to dress it up. When opting for corduroy, we also think you should be careful about what colour you go for, but we will discuss that next. So what colours can you wear to a winter wedding? When it comes to weddings, depending on which season you go in, colour plays an important factor of how well you'll fit in. First of all, check the invitation as there is a high chance your invitee will have labelled a colour scheme or at least hinted at what you should be angling for. If not, then the world of colour is quite literally your oyster, but this isn't the route we would go down. We would stick to a selection to a few colours. As it is a winter wedding, you can expect that people will stray away from the bright colours you can expect to see at summer weddings. We personally would stick a colour palette of neutral colours (although we'd say that stone and sand coloured suits should be kept for summer) and greys and browns should become your best friends. If you're going to go for a grey or brown suit, then remember that a wedding is a joyous occasion (it is a celebration after all) so let your accessories do the talking when it comes to colour. We are not suggesting you go overboard with a bright yellow tie with polkadots on it, but perhaps if you wear a navy suit, opt for a burgundy tie in wool so that you have a little colour. 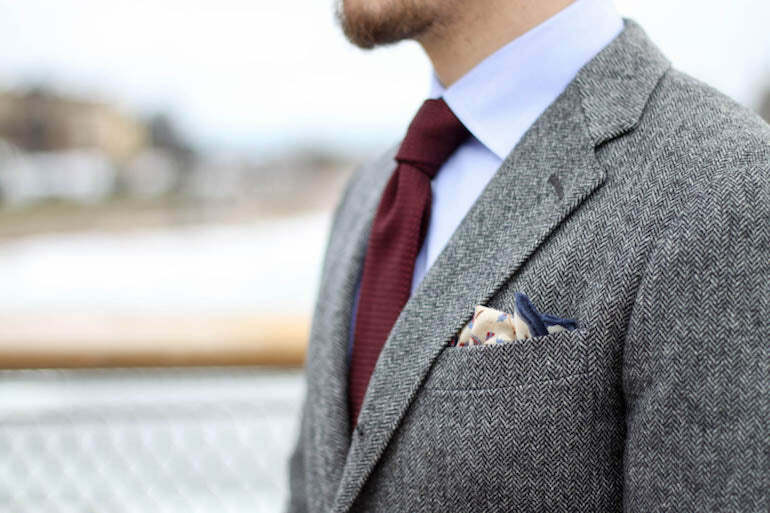 That said, you could also invest in a patterned pocket square - although we'd avoid anything too over-the-top. What Shoes Should You Wear? 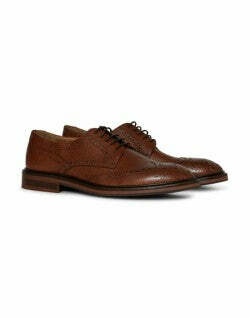 When it comes to choosing shoes for your suit, it really depends on what colour suit you go for. It is more than likely that you'll end up in a pair of black shoes. A blue or navy suit typically looks good with a pair of brown or black shoes, while a grey suit will again look good with either of those colours (you could also go for burgundy if you're feeling up to it). 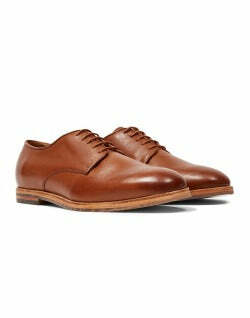 If you go for a brown suit, we suggest going for a pair of brown shoes, but avoid black shoes at all costs. 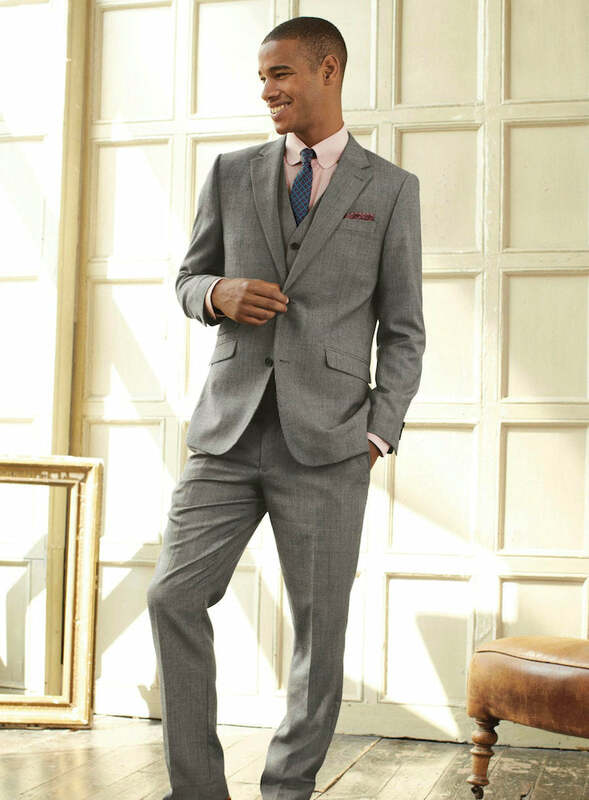 A charcoal grey suit is a great colour to wear for a winter wedding and is our personal preference, especially if it comes constructed in wool. With this we suggest wearing either black or burgundy shoes. 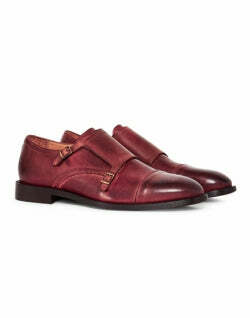 Shoes should be suede or leather, and don't go for anything that looks cheap (ever). As we have stressed already enough times, winter weddings tend to be cold. They take place during the coldest months of the year, but does not mean you won't be stood outside for long periods of times (as we said, this is most notable when you're waiting around for the couple whose wedding it is to have their pictures taken). An overcoat is your best bet and is the perfect winter coat, which will be perfect over any suit at a wedding in winter. 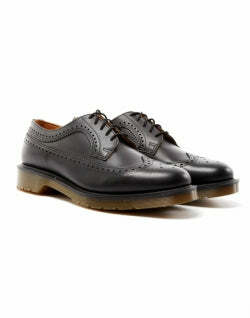 We again recommend one in either brown, black or charcoal. Above we have outlined our views and opinions on what to wear to a wedding in winter. We have given you ideas in an attempt to help you perfect your winter wedding outfits, and so you will be sorted for any celebration of marriage over the winter period. We highly recommend investing in a suit in a thicker material such as wool or corduroy, while making sure it comes in those neutral winter colours.